US special envoy to Afghanistan and Pakistan Marc Grossman, who formerly served as US ambassador to Turkey, gave a guest lecture last Tuesday as part of the IR4118 course "Turkey and the United States: Common Concerns and New ICT Instruments." 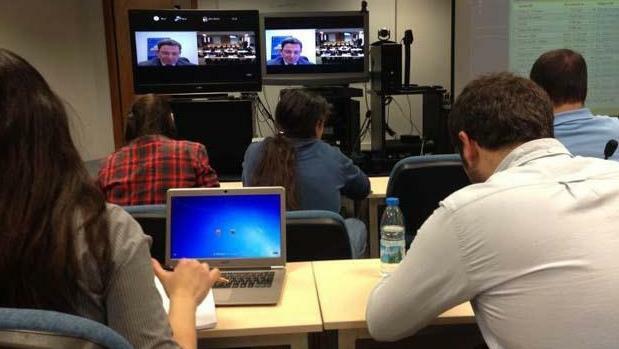 His audience included both Bilkent students and, via videoconferencing, students at Montclair State University in the US. The course is taught jointly by faculty members from both universities. In addition to his current post as special envoy and his time as ambassador to Turkey, Ambassador Grossman's long diplomatic career has included his appointment in 2001 as under secretary for political affairs, the third-ranking position in the US State Department. In his lecture, Ambassador Grossman spoke about foreign policy making, highlighting the role of public opinion, the media and innovative communication technologies. He focused his remarks on the Turkey-US relationship, Turkey's European Union accession process, and the increasing role Turkey has been playing in the region since the collapse of the Soviet Union in 1991. He emphasized the importance of Turkey as a strategic regional power and drew attention to the "Turkish model" in the context of the post-"Arab Spring" Middle East. Following the formal part of his presentation, Ambassador Grossman answered questions from both Bilkent and Montclair State University students, and shared his experiences as a diplomat and policy maker.